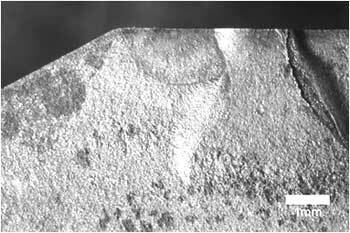 Corrosion Pitting is a primary source of fatigue site nucleation throughout virtually all industrial and military applications of metallic components other than stainless and titanium alloys. In airframe, automotive, naval, and piping applications corrosion pits produce stress concentrations reducing the fatigue strength. Even without the further complication of stress corrosion cracking or its cyclic variant corrosion fatigue, the corrosion pit can produce a stress concentration with a kt equal to at least 3, reducing the effective fatigue strength to one-third of the undamaged value. It is common practice in aircraft overhaul to remove the pitted layer by grinding followed by shot peening, producing a new surface. The pitting process then begins again, but now with a reduced section thickness. The structure is weakened with each iteration and eventually must be retired. 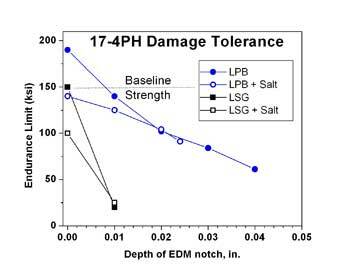 The introduction of a layer of stable compression on the order of a millimeter deep by Low Plasticity Burnishing (LPB®) can completely mitigate fatigue failures from corrosion pitting. Extensive work on laboratory coupons has eliminated surface failures entirely from severely pitted 7075-T6 aluminum, a high strength aircraft structural alloy, and 4340 steel, 50 HRC, commonly used for landing gear. LPB® either before or after pitting resulted in the same benefit, allowing surface enhancement to be used effectively either for initial manufacture or during repair and overhaul. Because the compressive layer exceeds the depths of the pits, fatigue initiation is completely eliminated in what would otherwise be a high stress concentration. Application of LPB® to fatigue critical areas can reduce inspection frequency and maintenance costs while providing component life extension. The nature of the pitting process in aluminum alloys offers a special opportunity to virtually eliminate corrosion pitting induced fatigue failures in aircraft structures. The depth of aluminum alloy pits increases rapidly initially, but asymptotically approaches a maximum depth over time. Extensive literature shows this is true for saltwater corrosion in laboratory specimens as well as in service. As the pit depth increases, the ionic diffusion to the bottom of the pit needed to support growth is retarded, and the pit eventually shuts down through passivation. New pits then start again on the surface at another location. Thus a series of pits are generated in the surface over time, with depth never exceeding some maximum determined by the alloy and solution. 7075-T6 aluminum exposed to alternate immersion in 3.5% sodium chloride solution reached a maximum pit depth of nominally .019 inches. Because shot peening may only introduce .010 inches of compression, the pits may exceed the depth of the shot peening compression in only a few years of service. Any benefit of shot peening is then eliminated and the structure is left weakened by the pit stress concentrations. If an LPB® layer of compression over .040 inches deep is introduced, corrosion pits will never reach even half the depth of compression. Fatigue failure from corrosion pits can be permanently eliminated without the need to even remove the corroded material and reduce section thickness for the life of the aircraft. Limited life supported by continuing maintenance is converted to safe-life, the service life is extended, and maintenance costs are reduced without changing either the material or design of the component. 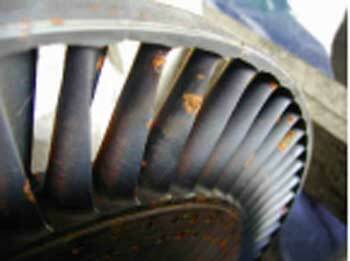 For more information on how LPB® can help increase the life of your parts please call 1-800-883-0851 or email us.